I have a thing for the original American foodies, that group centered around people like James Beard, Julia Child, Craig Claiborne, Waverly Root, and too-often forgotten contributors like Paula Peck and Simone Beck, or Simca (although Simca was, of course, French). Simca is better known as Julia Child's French collaborator for Mastering the Art, but she came out with her own cookbook as well, one filled with her own recipes and her own take on French food. 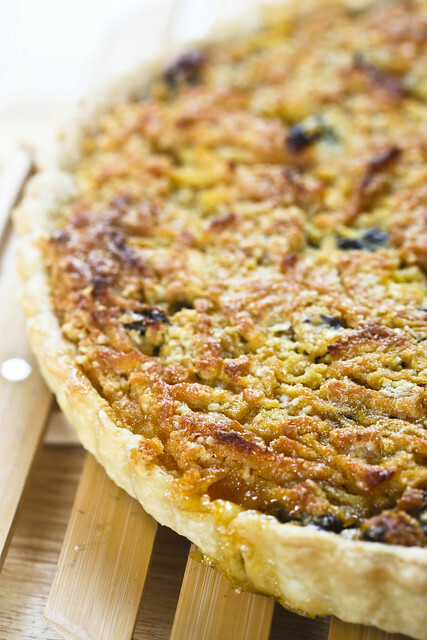 In Simca's Cuisine, Beck includes a recipe called La Tarte pour Jim, or Apple-Almond Tart for Jim. According to Evan Jones in Epicurean Delight: The Life and Times of James Beard, Simca dedicated her tart to James Beard as a symbol of her affection for the man who had been instrumental in establishing her reputation as a cook and as a teacher here in the US and even in France. All of which makes a great story, but let me tell you. I've made this tart twice in the last week and a half. It's not difficult, the ingredients are easy to get, and it's uncommon enough that people look reflective when they take their first bite, and delighted afterward. Put the flour, sugar and salt into a large mixing bowl (I like a large shallow one, since you'll be cutting the butter into the flour). Cut up the butter into small pieces and add it to the flour. Use a pastry cutter or two knives to cut the butter into the flour until it looks like oatmeal. Make a well in the middle of the flour mixture and pour the beaten egg into it. Use a fork to mix the egg into the flour, then switch to your hands and press the dough into a ball. Wrap in plastic wrap and chill in the refrigerator for at least 20 minutes until it's cold and firm enough to roll. Roll it out to about 1/8 inch and put the dough in a greased 8 or 9 inch tart pan with a removable bottom. Spread the apricot jam into a thick layer on the bottom of your dough-lined tart pan and return it to the refrigerator while you make the filling. Preheat the oven to 350F. Beat the egg yolks as you slowly add the sugar and salt. You'll beat it to the ribbon stage, when the yolks thicken and turn a bright lemony color. Stir in the almonds and the raisins, and set the mixture aside. Peel the apples and rub the cut lemon over the surface to keep them from browning. This isn't strictly necessary since you're going to bake them anyway, so I just juice the half of the lemon and throw it in the batter because it tastes good. Grate the apples over a bowl, since the apple juice will run everywhere if you try to do it over just a cutting board. Put small handfuls of apple shreds into a clean kitchen towel and remove the extra moisture by wringing the apple through the towel. Do it in batches, and then mix the apple shreds to the egg mixture along with the cinnamon. Scoop the filling into the tart shell. Put the tart into the oven and bake for 20 minutes. In the meantime, melt the remaining 4 tablespoons of butter. After 20 minutes, remove the tart from the oven and increase the temperature to 375F. 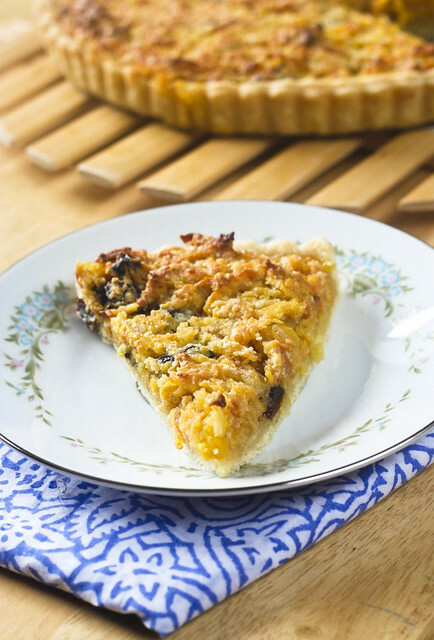 Poke a few holes in the top of the tart with a fork and pour the melted butter over it. Return to the oven for about 20 more minutes. Remove from the oven and let cool on a wrack before serving. wow!this looks perfect!thanks for sharing this hope i can make it as perfect as how youve done it!so delish! What a gorgeous tart! Definitely out-of-the-ordinary enough that it would give you pause after that first bite to appreciate it's unique taste! Hi! Your tart looks delicious! I found your site through Tastespotting...and I'm glad I did! I dont know if you have gathered from previous comments but your site..well..I ADORE IT, and so i really shouldnt have been quite so surprised by how much i truly loved this tart :) I made it the other day when i had a few yolks left over from other baking adventures and it is one of my favourite tarts ive ever made, so comforting and all the flavours work perfectllyyyy. I loved it! Heres the post if you ever fancy checking it out :) Thanks for a wonderful recipe!